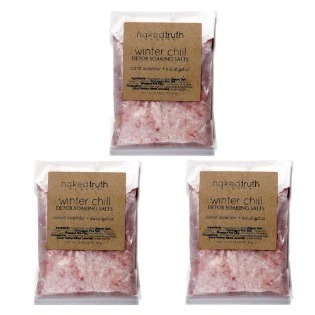 Keep calm and chill out with Naked Truth Beauty's adorable and conveniently sized soaking salts – a bargain in a pack of three! 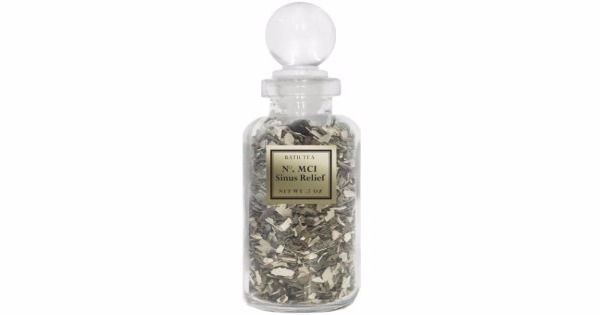 Winter Chill detoxes and remineralizes the body, and clears and calms the mind with pure, high quality salts, rhassoul clay, and essential oils. These single servings of bliss come in sustainable glassine pouches, which are biodegradable and made from specially compressed paper. That means they are free of all waxes, including petroleum-derived paraffin. Plus, the sticker is compostable! Infused with Eucalyptus and Vashon Island grown Lavender essential oils. Thanks for supporting local! They say good things happen in threes! Use note: Everyone is different! While our soaking salts are formulated to be non-irritating, if any discomfort or irritation does occur, cut your bath short and rinse with fresh water. Empty contents into warm bath and allow to dissolve for a minute or two before stepping in to enjoy the calm. For full detoxing benefits, soak for 30 minutes. Detoxifying baths can cause drowsiness. We recommend enjoying your bath while fully hydrated and when someone else is home. Magnesium Sulfate (USP Grade Epsom Salt), Sodium Chloride (Himalayan Pink Salt), Moroccan Lava Clay (Rhassoul Pink Clay), Eucalyptus Globulus (Eucalyptus) Leaf Essential Oil, Lavandula Angustifolia (Local Vashon Island Lavender) Essential Oil.